Quick Review: The human race is all but extinct after a war with Partials--engineered organic beings identical to humans--has decimated the population. Reduced to only tens of thousands by RM, a weaponized virus to which only a fraction of humanity is immune, the survivors in North America have huddled together on Long Island while the Partials have mysteriously retreated. The threat of the Partials is still imminent, but, worse, no baby has been born immune to RM in more than a decade. Our time is running out. Detailed Review: No offense, bu this book kind of bored me in the first part except when the babies died and they didn't even have names anymore. Too many questions that had no answers were asked in that part. This especially got on my nerves. But after that the tension starts to build as the story and the main character changes. Kira Walker wants to cure RM, the disease which killed countless lives. And she figured out the only way to do it is to find a Partial and examine it. Meanwhile, a group called the Voice are starting a rebellion due to the Hope Act, a law which stated that it was mandatory to be pregnant once you reached 18 years old. But rumours have started off it being lowered a year or two. But then it really happens: the Hope Act is lowered to 16 years old. Which means that Kira has to get pregnant. Not to say that she had to, you know, do it artificially, get what I mean? She has her boyfriend Marcus to do the job. When she really caught a Partial with a group of her friends, another rebellion which she didn't know threatened to happen, one which her actions caused. The only thing which keeps her going is the fact that one of her best friends, Maddy is pregnant and she wants to prevent the fate that her baby is due to suffer, which was to die. But then the Partial which she worked with, started another chain reaction. He said that his kind wanted to find peace with them, because they needed the humans' help. Because Kira did. And it turned out to be a lie. 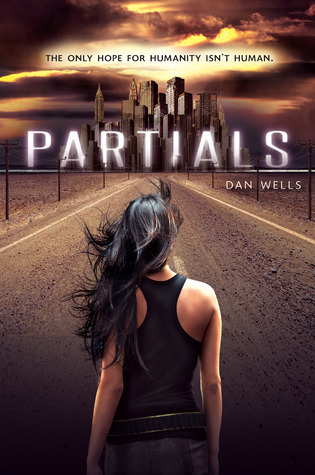 Instead, the Partials needed the humans to operate on, so that they could find a solution to the problem that had struck the Partials. And it was there that it led to the discovery that Kira was a Partial. And she found the cure for RM. A reason why you must read the book: it's good. And the last part was maybe one of the best I've ever read in cliffhangers. I really want to know why Kira is given that task, and what she really is. So I'm going to watch out for Fragments! Brief Review: This book had its own action and the characters were good. Although with a bit of science of it, this book still managed to impress me with its own level of uniqueness. Final Rating: 4/5 'Really Liked It!"